Mizy-ya and entrance to the tea room. On the bright side, I did get a call confirming that the visible wood for the room will be ready next week. 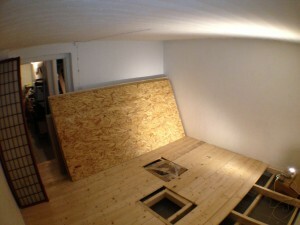 With luck and some hard work the room may be ready by the end of Easter. weekend) the saw works fine, when I use no extension cord or a shorter one it blows the fuse immediately. I’m no electrician, but that seems very odd. Bought the saw back to the store where I bought it. Told them the story of what happened, but they weren’t entirely convinced. That is until they tested it and the fuse for the entire wood storage blew. The offered me a new saw. To be on the safe side we tested it for the same faults. No sign of it. 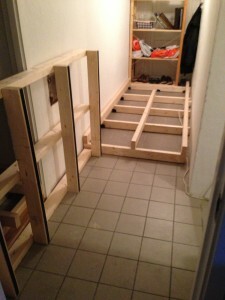 Back home again I started fixing my mistake from yesterday with the floor boards for the mizu-ya. After a few cuts the saw kills the fuse again. Seems like the issue is exactly the same with the new saw. I capitulated, brought out the long extension cord and got to work. If any electrician can explain to me what is happening to my saws I would be very grateful. 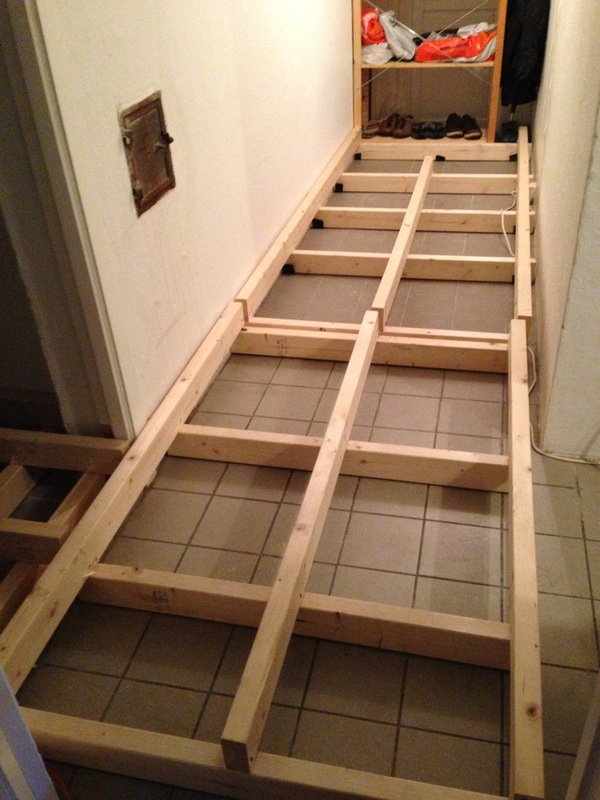 By the end of the day I had completed the mizu-ya floor today. Also I put one layer of paint the two types of walls I’m going to use. I want to see how the colour I have bought looks on the actual surfaces I will be using. Expect I need two or three layers before I can see the finished colour. Also I need to get hold of some sand to put into the paint so that it will get the right texture. The Tea-room, taken with a wide angel lens on a iPhone 5. Wanted to put on the floor boards for the entire Tea-room today. I had just enough boards, but ran out of screw’s before I could complete it. 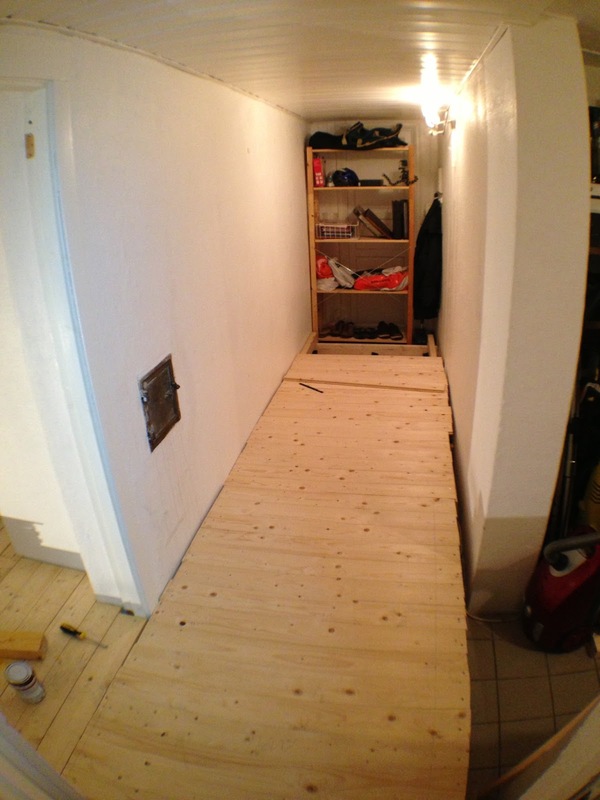 I got the remaining boards already cut into the right lengths in the next room, so it should be quick to add the last boards once I got the screw’s. Got some other stuff in my calendar for tomorrow but I hope I’ll be able to make a quick trip to the store and get wood for the mizuya and screw’s. The corner posts, and the sliders for the doors has been ordered from a lumber mill I’m very excited to see the result. They have said they will have it ready for Easter. I’m keeping my fingers crossed for putting it all up next weekend. Today we started on the Tea-room. First order of business was to make a platform onto which the tatami can be placed. This has two purposed. Mainly allow for a sunken RO. 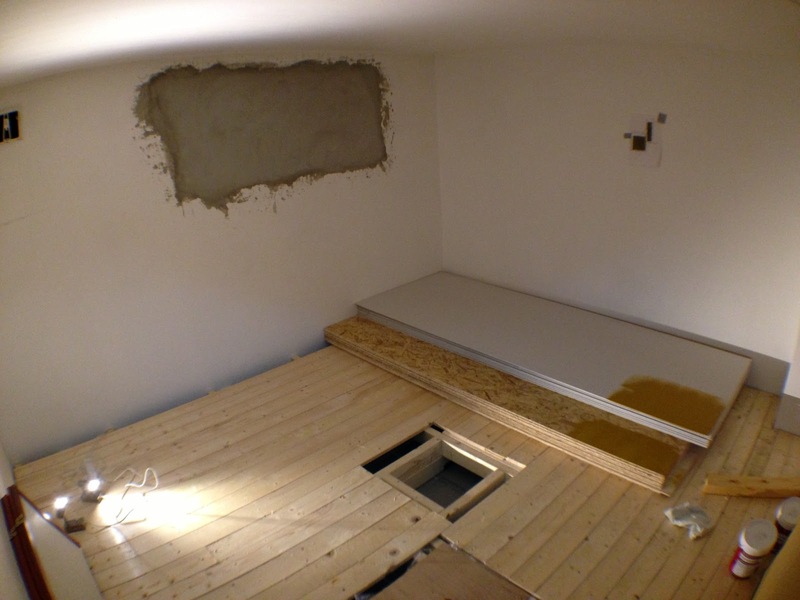 In the image you might see two small squares, this is where the RO will go. So I will be able to do both regular and gyakugatte. 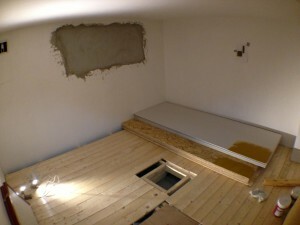 The second purpose of the raised floor is to reduce the hight of the ceiling to proximately 185cm. This leaves me the choice of either just keep it at 185cm or reduce it further by adding some nice wood to cover up the white concrete ceiling. It doesn’t look like that much work, but it took the two of us the better part of a day. Tomorrow we will continue and do the same thing for the mizuya. 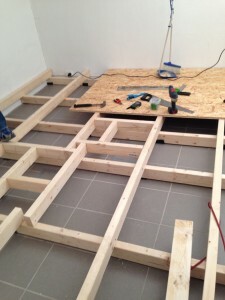 I hope that we will be able to start putting down the wooden floor tomorrow too, but after today I’m not certain.